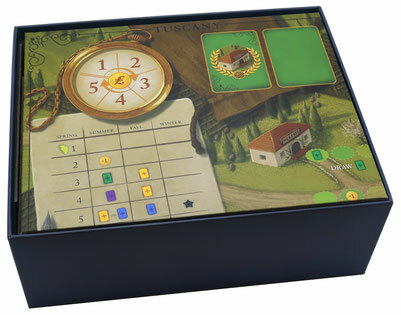 Compatible with Viticulture Essential Edition®, and the Tuscany Essential Edition®, Moor Visitors®, and Visit from the Rhine Valley® expansions. 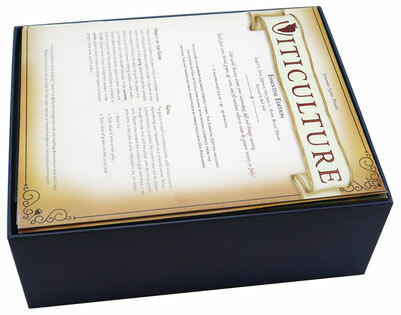 Note: Insert designed for game with external box dimensions of 27.0 x 22.0 x 10.0 cm. Here you can see the top layer of trays, and below the other layers. Note three of the construction mat tiles stored vertically on the left hand side of the box. These are the trays for the player pieces, one for each of the six colours. 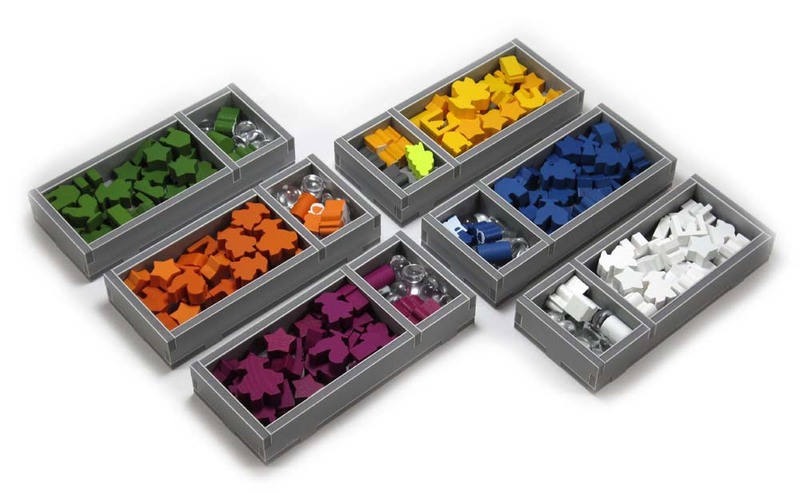 The smaller section in the tray is for the special worker meeples, the victory point marker, and also for approx 10 of the glass wine markers. 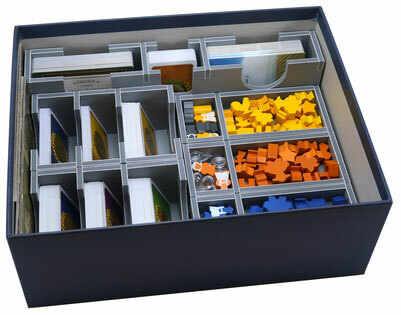 The sixth player tray, in this case the yellow one, stores in this slot the grey meeples instead of the glass wine markers. There is one large tray for coins, with separate slots for the 5 value coins. 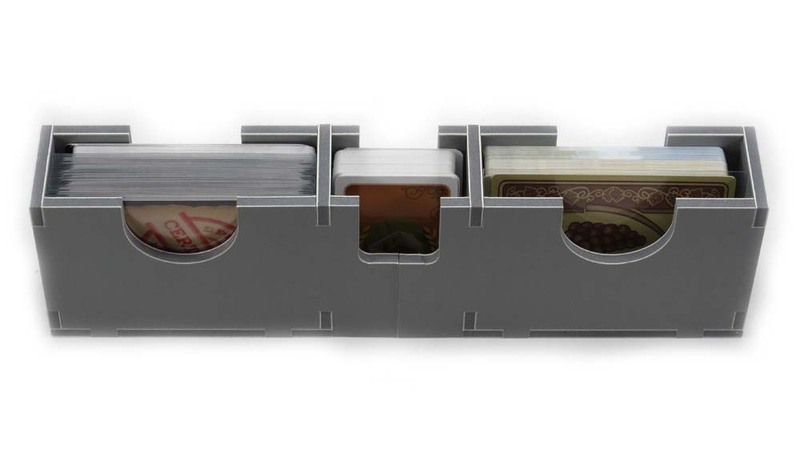 The main card trays have three slots each, one for each of the card types. 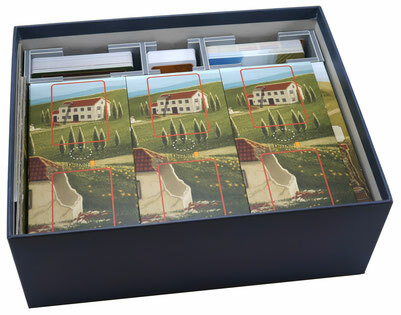 the empty slots shown at the back of the trays are for the visitor cards from the Visit from the Rhine Valley® expansion. All cards can be sleeved. 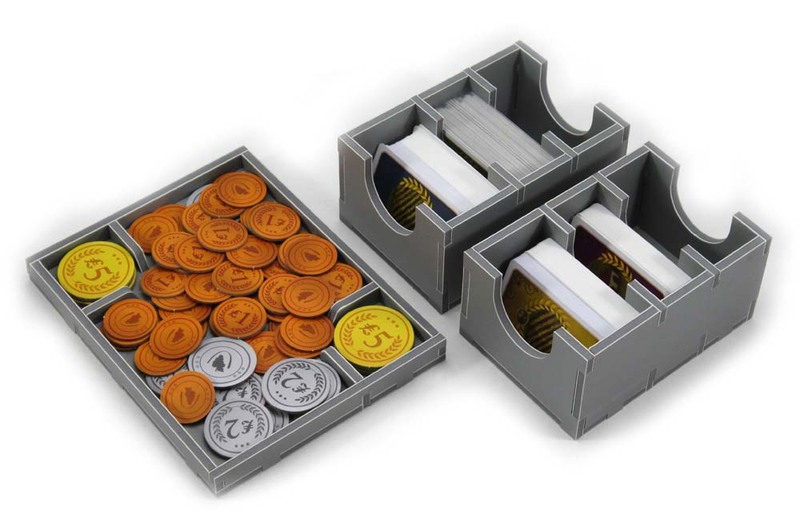 The large coin tray works equally as well with the metal coins available for the game. 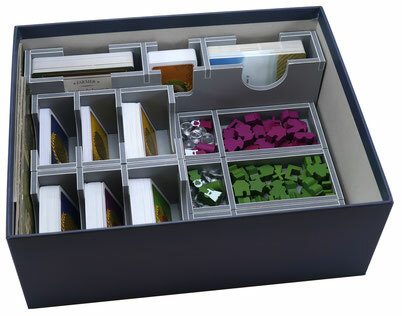 There are two large trays for the standard sized cards from the game. In between these is a slot for the structure cards. This central slot does not have a base, so these trays should ideally be left in the box. Again all cards can be sleeved. When clearing the game away and packing the box, the player boards go on top of the lower trays acting as a lid. On top of these the remaining three construction mat tiles go side by side. This fills the box to the height of the card trays on the top of the box. Next go the boards, one on top of the other. Lastly, the game rules go on top of the boards. It should be noted that this is a very tightly packed box, and in order to ensure the trays have sufficient space for the components, the height when packed pushes the lid up 2 mm when closed. This compromise was made in order to make the trays more practical for storage.